In October 2011 we read Fahrenheit 451 also by Ray Bradbury. "... And two boys will discover the secret of its smoke, mazes, and mirrors; two friends who will soon know all too well the heavy cost of wishes. . .and the stuff of nightmare. 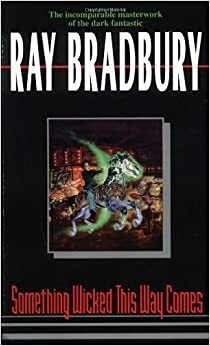 Few American novels written this century have endured in the heart and memory as has Ray Bradbury's unparalleled literary classic SOMETHING WICKED THIS WAY COMES. For those who still dream and remember, for those yet to experience the hypnotic power of its dark poetry, step inside. The show is about to begin."